I hope you enjoyed last month’s Western theme. This month, in honor of Valentine’s Day, we’re doing a Love Ain’t Easy theme, and as a special treat, in a few weeks we’ll have a guest post by a friend of mine who recently had her first book published. I feel for Marty and Clara. At the same time, I want to slap them for wallowing in self-pity. “Snap out of it!” I yelled as I watched, brandishing my SunChips at the T.V. in exasperation. Then again, marriage was expected. If you were 34 and unmarried in 1955, something was horribly wrong with you. “Why are you still single? You ought to be ashamed of yourself!” elderly ladies scold Marty. We don’t wonder at his depression. The single life isn’t always that great when you’re a shy, not-drop-dead-gorgeous person constantly hounded by matchmaker septuagenarians. After an outburst in front of his nagging mother, Marty goes to the Stardust Ballroom, where he meets Clara. She’s not at her best – her jerk of a date just abandoned her for a prettier girl (how he did it elevates him to super jerk status). Clara, a 29-year-old NYU grad, teaches high school chemistry. Which makes me wonder: is her intelligence one of the film’s reasons for her “unattractiveness”? Since this is 1955, I’d say yes. Now, over 50 years later, some males still find it intimidating. 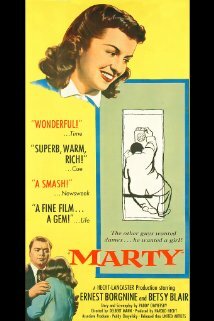 Marty is a bit of a downer at times, but I appreciate its quality acting and moving portrayal of still-relevant social problems. The film touches on the idiocy of unrealistic beauty standards and the downside of singledom … while nicely contrasting it with marital issues (live-in mother-in-laws, fussy babies, fights, etc.). Not to mention peer pressure. But shouldn’t Marty have enough backbone to stand by his choice? I think so. From the first, Marty (played by Ernest Borgnine) seems like a really nice guy. He’s friendly and patient with the customers in the butcher shop where he works, even with those who pester him about being single now that all of his siblings are married. Those who know him well don’t see a reason why he can’t find a pretty girl and settle down and get married, but Marty knows why: he’s fat and ugly. At 34, he’s tired of being rejected for his looks. Then he meets a young woman familiar with rejection, who’s being ditched at a dance because of her plain appearance. Marty becomes a knight in shining armor by treating her as if she were one of the beautiful, much sought after women she’s been passed over for so many times. Granted, Marty does fall off his horse for a while when he lets his mother and friends convince him Clara’s not good enough for him, but picks himself back up in the end. Comments on the characters: Marty’s character is easy to connect with. Most of us have had to endure remarks about singleness or have faced rejection of some sort at some time and can empathize with the frustration and hurt Marty feels. He gained my respect for refusing Clara’s shifty-eyed blind date’s offer of $5 to walk her home and then for asking her to dance after her date abandons her. However, I didn’t like his friends. “Slime balls” comes to mind when I think about them. Since birds of a feather flock together, the connection rubs off some of Marty’s gentlemanly appearance. One particular conversation, however, between him and his friend Angie (“What do you wanna do tonight?” “I dunno, Angie. What do you wanna do tonight?”) sounds like a conversation I’ve heard before. Maybe one I’ve participated in…. Also, I thought Marty’s distinctive way of talking suited his character very well. Clara: This lonely schoolteacher is very likeable, tough the scene when Marty asks her to dance and she slowly turns around and starts to cry on his shoulder is a trifle strange. However, she has a very nice smile, and I like the way the camera shots emphasize her smile and the way her face brightens when she smiles. Conclusion: The movie was a little slow, but I liked the story of two people looking beyond appearances and other’s opinions. Ever seen Marty? Any thoughts on books or movies that fit our Love Ain’t Easy theme? This entry was posted in Entertainment, Films and tagged Ernest Borgnine, Marty, romance, singleness by Elizabeth Kitchens. Bookmark the permalink. First thing that came to mind was a song. A modern song. “Wait” by Group 1 Crew. Great song lyrics, Lucy. Thanks for sharing. The Unsinkable Molly Brown and Calamity Jane are good movie choices. It’s been a really long time since I’ve seen The Unsinkable Molly Brown; I should watch it again.